In addition to the pilot fuel strainer near the pilot fuel valve and the fuel strainer near the fuel supply tank, there are two filters on Model 735 Stanleys. Both filters are located in close proximity to each other on the right side of the car just in front of the firewall. 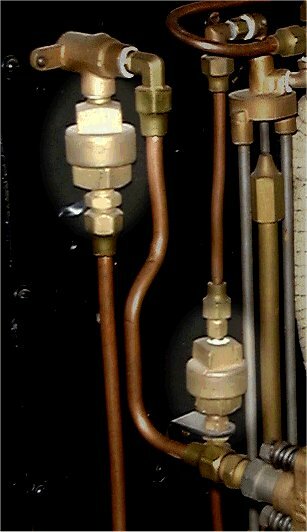 One filter is located in the water supply line that feeds the boiler water automatic while the second filter is located in the burner fuel supply piping just before the low water and the steam automatics. The purpose of both filters is to insure that small particles of debris are not carried into the valve mechanisms and keep the valves from in the automatics from closing off tight. Strainers and filters are different in that strainers are for retaining larger solid particles of material. Strainers are basically fine wire screens that trap larger particles of matter while allowing a fluid and any matter suspended in the fluid to pass. A filter generally consists of a porous material (like paper) through which a gas or liquid is passed to separate out any matter in suspension. As the gas or liquid passes through the porous material any suspended matter is trapped in the crevices and cavities of the porous material. The basic difference in the Stanley strainer and filter is in the size of the wire screens used with the filters having a much finer screen than the strainer. Shown in the photograph at the left is the water filter (left at top of photograph) and the fuel filter (right at bottom of photograph). The water filter is attached to the water automatic bypass valve for support. The fuel filter is mounted to a bracket screwed to the firewall for support. For additional information on the construction of Stanley strainers and filters see the discussion on the Pilot Fuel Strainer.